“This year’s wine festival surpassed our wildest imagination with some of the best winemakers and master distillers in the world attending and educating record-breaking crowds with their knowledge,” said Chan Cox, festival founder and owner of Wine World. South Walton Beaches Wine and Food Festival wrapped up an exciting and record-breaking week of wine tasting, Champagne and spirits sipping, tasting seminars, live music and more as record attendance was set for the annual charity festival. More than 4,000 people attended the festivities in Grand Boulevard at Sandestin, located in Northwest Florida, along the award-winning beaches of South Walton. The festival is a fundraiser for Destin Charity Wine Auction Foundation. “This year’s wine festival surpassed our wildest imagination with some of the best winemakers and master distillers in the world attending and educating a record-breaking crowd with their knowledge,” said Chan Cox, festival founder and owner of Wine World. The wine industry comes out in force to support the festival, with dozens of celebrity winemakers and knowledgeable wine industry professionals attending the event to discuss their wines and winemaking. Cristina Mariani-May of Banfi Vintners, Ronan Laborde of Chateau Clinet and Jeff Mausbach of TintoNegro were among the attending featured winemakers. The festival also showcased some of the best craft spirits in the country with iconic master distillers Jimmy Russell of Wild Turkey, Willie Pratt of Michter’s and Wes Henderson of Angel’s Envy meeting and mesmerizing attendees with stories and histories from their distilleries. “The people who participate in our festival are passionate about what they do and they enjoy sharing that passion with festival attendees. We are equally passionate about charity and have this festival to make a real difference in children’s lives,” continued Cox. Next year’s annual South Walton Beaches Wine & Food Festival will be held April 27 – April 30, 2017 throughout the Town Center of Grand Boulevard at Sandestin. The festival features a stunning showcase of the best wines the world has to offer. 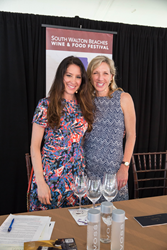 Celebrity wine producers and chefs present fine wine and food pairings from the world’s most famous appellations. The Savor South Walton Culinary Village offers a sumptuous array of foods to taste, wines to pair, as well as wine and food tasting seminars and live entertainment. The event is a major fundraiser for Destin Charity Wine Auction Foundation, which benefits children in need in Northwest Florida. For more information, including a list of attending winemakers and to purchase tickets, visit http://www.SoWalWine.com.